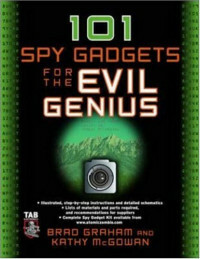 This book offers an amazingly awesome and complete collection of professional spy tools that you can build yourself. You can build any project in this thrilling arsenal of spy devices for $30 or less! Not only that, even total beginners to electronics can construct these mind-boggling snooping tools. Brad Graham is an inventor, robotics hobbyist, founder and host of atomiczombie.com Web site, which receives nearly a million hits a month, and a computer professional. He is the coauthor of Atomic Zombie's Bicycle Builder's Bonanza, perhaps the most creative bicycle-building guide ever written, and Build Your Own All-Terrain Robot, both also from McGraw-Hill. Technical manager of Freedom 2000 Complete Technical Services, which specializes in computer network setup and maintenance, data storage and recovery, and security services, Mr. Graham is also a Certified Netware Engineer, a Microsoft Certified Professional, and a Certified Electronics and Cabling Technician. Kathy McGowan provides logistical and marketing support for Brad's many robotics, bicycle, computer, and publishing projects. She also manages the daily operations of Freedom 2000 and several Web sites, including atomiczombie.com and xtremeclothes.com, as well as various Internet-based blogs and forums. Additionally, Ms. McGowan provides computer training, advises on Internet security risks, and writes articles for ezines. “High Voltage Engineering” has been written for the undergraduate students in Electrical Engineering of Indian and foreign Universities as well as the practising electrical engineers.